Slakoth is a Pokemon that looks a lot like a sloth. 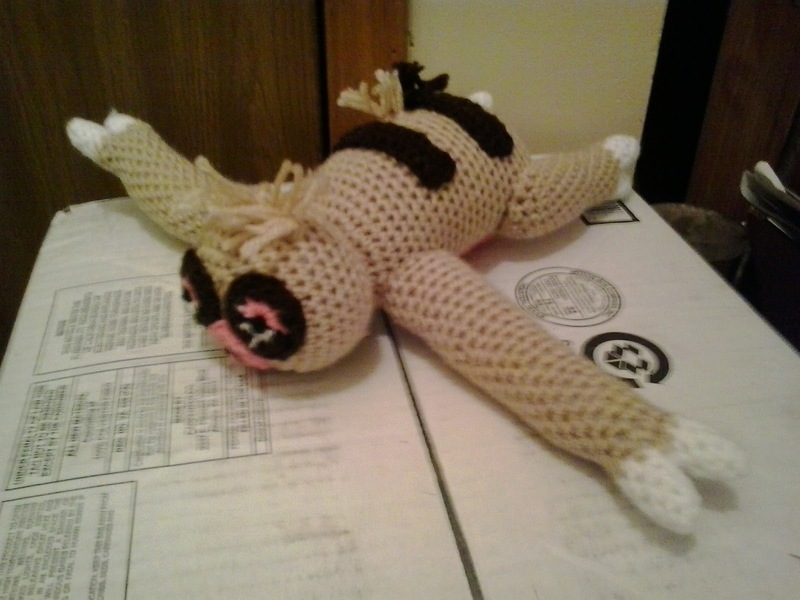 My daughter saw a sloth on the GEICO commercials and wanted me to make one for her. When she saw that there was a Pokemon that looked like a sloth, she decided to Slakoth to her extremely long “to do” list. This is the pattern that I came up with for Slakoth. This pattern includes the color lists for both Slakoth and Shiny Slakoth. Worsted Weight Yarn (Shiny colors in parenthesis): Buff (Lavender), perfect pink, coffee brown, black, and white. Finish off leaving a long tail. Weave tail through sc of Rd 30, pull tightly and secure. Weave in ends. Finish off leaving a long tail. Weave tail through sc of Rd 15, pull tightly and secure. Sew HEAD to BODY. Finish off leaving a long tail. Sew EYES to BODY. Embroider black dividing lines. Using French knots, create pupils on EYES. Finish off leaving a long tail. Sew NOSE on HEAD. Fringe on 2 pieces of buff to top of HEAD over 5 sc. Trim to desired length. Finish off leaving a long tail. Sew BELLY to BODY. Finish off leaving a long tail. Sew BACK SIDE to BODY. Finish off leaving a long tail. Sew BACK STRIPES to BODY leaving 4 Rds between each stripe. Fringe on 2 pieces of buff in a triangle between BACK STRIPES. Fringe on 2 pieces of coffee brown in a triangle pattern on BACK STRIPE closest to back right leg. Finish off leaving a long tail. Stuff FRONT LEGS firmly. OPTIONAL: INSERT FLORAL WIRE. Sew FRONT LEGS to BODY. Finish off leaving a long tail. Sew BACK LEGS to BODY. Slakoth, Shiny Slakoth, and Pokemon are copyright Nintendo and their respective creators.